The height of past populations can thus tell historians much about the conditions that individuals encountered in their formative years. Given sufficient data it is possible to glimpse inside households in order to piece together a history of the impact that declining wages, rising prices, improvements in sanitation and diminishing family size had on mean adult stature. However, many studies of height and nutrition in 18th- and 19th-century Britain focused on military records and therefore had little to say about women. The turn to using the rich records of heights for men and women (and children) in 19th-century penal records has been more recent. Today’s post is going to look at height patterns in four Digital Panopticon datasets, mainly using a kind of visualisation that many historians aren’t familiar with: box plots. If you’ve seen them and not really understood them, it’s OK – I didn’t have a clue until quite recently either! And so, I’ll start by attempting to explain what I learned before I move on to the actual data. A box plot, or box and whisker plot, is a really concentrated way of visualising what statisticians call the “five figure summary” of a dataset: 1. the median average; 2. upper quartile (halfway between the median and the maximum value); 3. lower quartile (halfway between the median and minimum value); 4. minimum value; and 5. maximum value. The thick green middle bar marks the median value. The two blue lines parallel to that (aka “hinges”) show the upper and lower quartiles. The pink horizontal lines extending from the box are the whiskers. In this version of a box plot, the whiskers don’t necessarily extend right to the minimum and maximum values. Instead, they’re calculated to exclude outliers which are then plotted as individual dots beyond the end of the whiskers. So what’s the point of all this? Imagine two datasets: one contains the values 4,4,4,4,4,4,4,4 and the other 1,3,3,4,4,4,6,7. The two datasets have the same averages, but the distribution of the values is very different. A boxplot is useful for looking more closely at such variations within a dataset, or for comparing different datasets, which might look pretty much the same if you only considered averages. For each dataset, I only included women who had a year of birth, or whose year of birth could be calculated using an age and date, as well as a height. (I say “heights” above because I can’t guarantee that they are all unique individuals; but nearly all of them should be.) In all the following charts I’m including only adult women aged over 19. 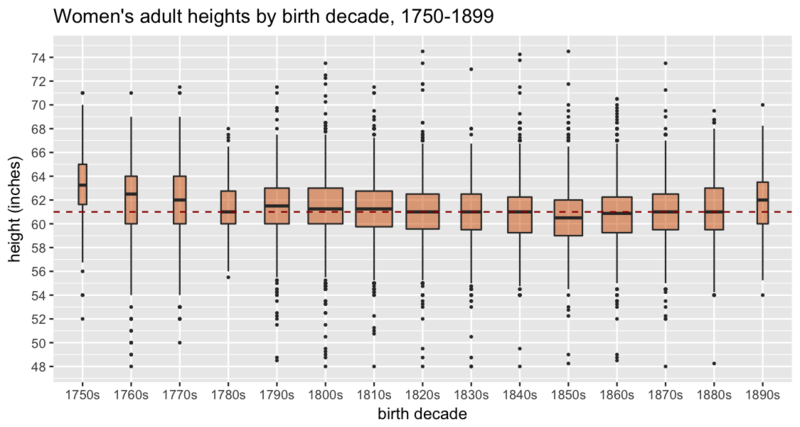 Here’s what happens when you plot the heights for each birth decade in RHC. The first thing I look for is incongruities that might suggest problems with the data, and on the whole it looks good – the boxes are mostly quite symmetrical and none of the outliers is outside the realms of possibility (the tallest woman is 74.5 inches, or 6 foot 2 1/2, and the shortest is 48 inches), though I’m slightly doubtful that there were women born in the 1800s in this dataset, which gets going in the 1880s; still, they’re a very small number so unlikely to skew things much overall. Since the data seems to be OK on first sight, the interesting thing to note here is that from the 1850s onwards, the women are getting taller, and those born in the 1890s are quite a lot taller than the 1880s cohort. This is fairly consistent with Deb Oxley’s (more fine-grained) observations of the same data. Again, we have a reasonable spread of heights and fortunately very small number of slightly questionable early births. (It happens to be the case that this data was manually transcribed, whereas RHC was created using Optical Character Recognition – but on the other hand, the source for RHC was printed and much more legible than the handwritten indents.) Ignoring for now the very small groups before the 1770s, the tallest decade cohort of women in this data is those born in the 1790s and thereafter they get consistently shorter. I’ve filtered out women born before 1750 and after 1899, because the numbers were very small, and some extreme outliers (more about those later…). Then I added a guideline at the median for the 1820s (the mid-point), as I think it helps in seeing the trends. It might seem surprising at first that the late 18th-century women of HCR are taller than any subsequent cohorts until the 1890s. Yet the trends here are broadly consistent with the pioneering research by Roderick Floud et al on British men and boys between 1740 and 1914. They argued “that the average heights of successive birth cohorts of British males increased between 1740 and 1840, fell back between 1840 and 1850, and increased once again from the 1850s onwards” (Harris, ‘Health, Height and History’). The British population was less well-fed for much of the 19th century (as food resources struggled to keep up with rapid population growth), and it got smaller as a result. Our women’s growth after 1850 may be slower than for the men (until the 1890s) though; perhaps it took longer for women than men to start growing again. But this is what HCR looks like. This is not good. If we’re lucky, much of the problem could turn out to be errors in the data which can be fixed. After all, it’s at least roughly the right kind of shape! The big spike at 60 inches (5 feet) rings plenty of alarm bells though. It looks reminiscent of a problem we have with much of the age data in the Digital Panopticon, known as “heaping“, a tendency to round ages to the nearest 0 or 5 (people often didn’t know their exact dates of birth). The age heaping is very mild in comparison to this spike, so I think it could well be another issue with either the transcription or the method used to extract heights. But if it turns out that’s not the case, this could be pretty problematic. We’re assuming the prisoners were properly measured, but we don’t know anything about the equipment used. For all we know, it might often have been largely guess work. In the end, we might find that HCR simply isn’t reliable enough to use for demographic analysis. There’s very little height data for women born in the 18th century, so this is a potentially really important source. But what if it’s not up to the job? John Canning, Statistics for the Humanities (2014), especially chapter 3. H Maxwell-Stewart, K Inwood and M Cracknell, ‘Height, Crime and Colonial History’, Law, Crime and History (2015). Deborah Oxley, David Meredith, and Sara Horrell, ‘Anthropometric measures of living standards and gender inequality in nineteenth-century Britain’, Local Population Studies, 2007. Deborah Oxley, Biometrics, http://www.digitalpanopticon.org (2017). Bernard Harris, ‘Health, Height, and History: An Overview of Recent Developments in Anthropometric History’, Social History of Medicine (1994). Jessica M. Perkins et al, ‘Adult height, nutrition, and population health’, Nutrition Reviews (2016). This entry was posted in Crime/Law, Digital History, Digital Panopticon, WHM, Women/Gender and tagged data visualisation, statistics, whm18. Bookmark the permalink.